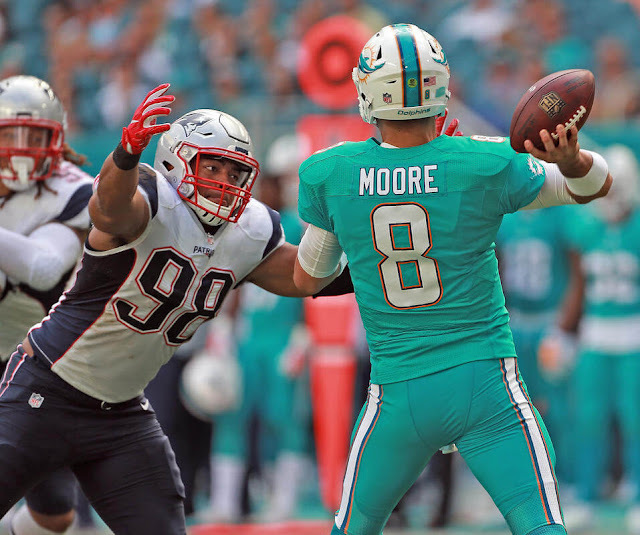 HEAT’S ON: Trey Flowers puts pressure on Dolphins quarterback Matt Moore. The Patriots believe that all season they were overlooked and underappreciated on defense. Through all that, they allowed 15.6 points per game, the best mark in the NFL in the last three years. The Pats traded marquee pieces Chandler Jones and Jamie Collins and dealt with other bouts of adversity along the way. From Week 11 on, they ranked first in points allowed (12.4), fifth in takeaways and sixth in sacks (18). The Patriots were scrambling to find Dont’a Hightower’s running mate after trading Collins, and prematurely vaulted Elandon Roberts into a prominent role. The undrafted rookie played well in spurts earlier in the season, but was exposed in Weeks 8-11, which led to the combination of Shea McClellin and Kyle Van Noy. McClellin is ever-steady, and makes the occasionally loud play, most recently by returning a back-breaking fumble 69 yards against the Miami. He also has a couple of blocked kicks and rarely finds himself out of position. Van Noy still struggles in coverage, notably by allowing Miami’s Kenny Stills’ free release on a 25-yard touchdown Sunday, but he has a sack, four pressures, a forced fumble, drawn holding penalty and two run stuffs since cracking the lineup in Week 11. Hightower, a first-time Pro Bowler, settled back into his role as the field general without needing to be as concerned with the guy next to him. Coach Bill Belichick and coordinator Matt Patricia rotated their cornerbacks the first two months of the season because they wanted to see who would emerge behind Malcolm Butler, who took a major step forward this season. Finally, in Week 11, they settled on Eric Rowe as the right corner and Logan Ryan in the slot. Ryan has been the greatest beneficiary because he thrives when given a consistent role. Since then, quarterbacks targeting Ryan went 14-of-34 (41.2 percent) for 129 yards (18.4 per game), no touchdowns and two interceptions, and he had a team-high five pass breakups. Rowe has surrendered 11 completions on 28 attempts (39.3 percent) for 129 yards (21.5 per game), no touchdowns and one pick, and he added three breakups. Butler has been terrific, allowing two or fewer catches in nine games, including Sunday. He allowed fewer catches (48), a lower completion percentage (52.7 percent), fewer touchdowns (four), committed fewer coverage penalties (three) and increased his interceptions (four) and matched his pass breakups (14) in 2016. And since a rough day against the Jets in Week 12, Butler has surrendered eight catches on 17 targets (47.1 completion percentage) for 141 yards (28.2 per game) with three interceptions and three pass breakups. The Patriots featured Trey Flowers along the defensive line during the second half. The second-year defensive end led the team with seven sacks, all since Week 8, and six originated from an interior rushing position. He had two quarterback hits from the inside against the Dolphins, too. By thrusting Flowers into the starting role, the Patriots got the luxury of reducing snaps for Rob Ninkovich and Chris Long, who don’t play like they’re on the wrong side of 30 because of those additional resting points. Just look at the results since Ninkovich and Long appeared to dip midway through October. Since Week 8, Long has three sacks, three quarterback hits, 11 pressures, one forced fumble and a batted pass, and he forced two holding penalties. Ninkovich has four sacks, two quarterback hits, 10 pressures, a forced fumble and a batted pass. Jabaal Sheard’s re-emergence has also been crucial, particularly since his benching two weeks after the Collins trade raised many an eyebrow. Since, he has 1.5 sacks, three quarterback hits, five pressures, a forced intentional grounding and a drawn hold. Devin McCourty has been more of a playmaker since Week 13, though it doesn’t appear to be the result of a schematic change. The three-time Pro Bowler is simply around the ball with greater frequency. The safety had an interception, three pass breakups, a forced fumble, a fumble recovery and a run stuff during that span. Prior, he only had two breakups and one run stuff. McCourty essentially has clinched a pair of victories in the last three weeks, delivering a jarring hit to Demaryius Thomas to break up a fourth-down pass against the Broncos and then forcing Damien Williams’ fumble in the fourth quarter against Miami. The Patriots have noticeably increased their zone looks on the back end, and those assignments have really tightened up since the loss to the Seahawks. It’s confused quarterbacks, and Ryan showed the benefit of their increased comfort Sunday by peeling back and picking off Matt Moore. It’s been a key up front, too. There are plenty of occasions in every game when edge defenders such as Ninkovich, Long, Flowers, Sheard, McClellin and Van Noy have various coverage assignments. By stacking their front with versatile, interchangeable players, the Patriots can be a nightmare when they disguise their coverage and blitz assignments.